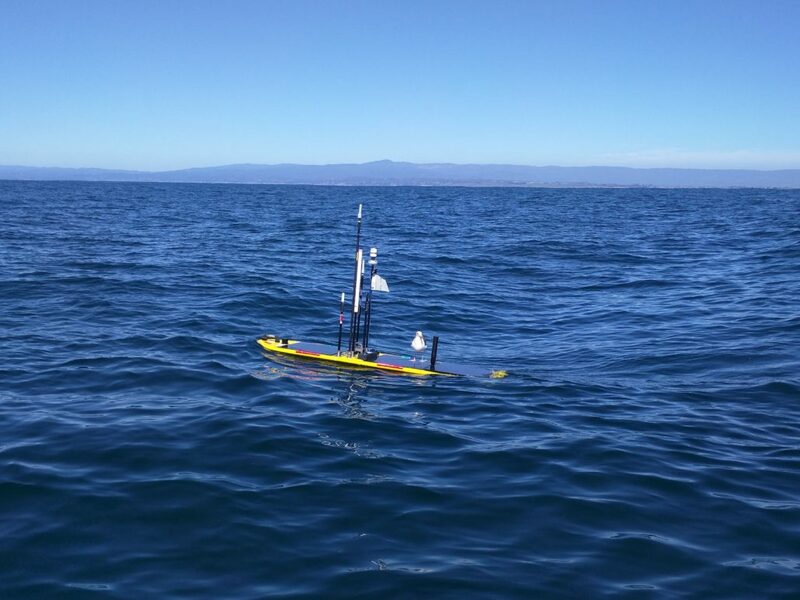 During one of its recent missions, MBARI’s Wave Glider Tiny ran into some problems. Researchers monitoring data received from the vehicle via satellite noticed the data were not quite right, even though Tiny appeared to be navigating as programmed. When the team went to sea to recover the glider, they discovered major damage to the fiberglass hull, mast, and solar panels. The Wave Glider is an autonomous surface vehicle (ASV) that has a surfboard-like float with a tethered glider below, equipped with spring-loaded paddles that use wave energy for motion. Solar panels on its surface power the scientific instruments and satellite communications as it travels at a top speed of approximately two knots (2.3 miles per hour). Depending on its mission, it can be deployed for weeks at a time, collecting data and sending them back to the researchers on shore. Tiny is designed to avoid collisions by detecting other vessels via an automatic tracking system for vessels carrying an Automatic Identification System. Additionally, it carries a radar repeater to allow detection by other vessels, and a bright light and flag on the mast increase its visibility. Researchers don’t know the circumstances of the incident, but after some extensive repairs, Tiny was ready to get back to its next mission, gliding in the water to continue collecting scientific data. 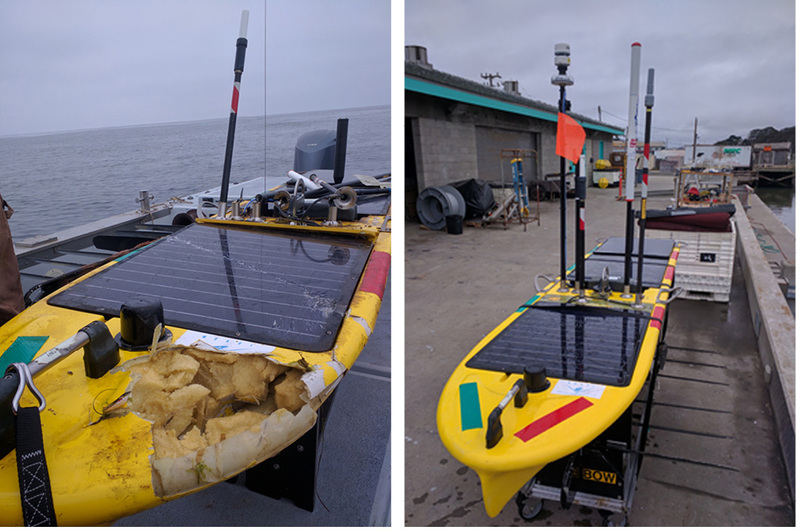 MBARI is beginning to use ASVs for many of the well-defined, repetitive tasks that ocean scientists previously depended on ships for, allowing the ships to be used for other research projects. And at the same time MBARI engineers are developing ways to use them as communication gateways and navigation aids for autonomous underwater vehicles. Watch the video below to see Operations Engineer Chris Wahl deploy MBARI’s Wave Glider Tiny from R/V Paragon for another mission.